For those looking for a stable, well-paying government job without getting into the cut-throat current of the UPSC exams, the SSC CGL (Staff Selection Commission – Combined Graduate Level Examination), conducted annually to fill up posts in government departments, ministries and other organisations, is the ideal choice. The SSC CGL notification for 2019 is expected to be out soon, sometime around May 5, so now is a good time for aspirants to not only start focussing on their preparation but also think about SSC CGL post priority. Given that there are 33 different post categories to choose from, deciding your SSC CGL post preference order is never an easy task. Of course, you need to work hard toward securing a good score to make the cut for your SSC CGL preferred posts. It is also important to understand job profile and pay structure for each to ensure that you do not miss out on SSC CGL best posts despite a good score. Until last year, the SSC CGL post preference order had to be indicated in the application form. Profile: Conducting audits for different government departments, organisations and PSUs. Involves travelling. Profile: Clerical desk work in headquarters, and tax verification for goods at ports for field postings. Career Growth: Appraiser-Assistant Commissioner-Deputy Commissioner-Commissioner. Profile: Verifying, assessing and processing Income Tax records of businesses and individuals. Conducting raids, when required. Profile: Administrative work such as compiling reports, sending out event updates, emailing, maintaining records etc. Career Growth: Departmental exam based first promotion after eight years. By seniority, first promotion in 15-17 years. Profile: In headquarters, executive work related to central excise & service tax augmentation, and in field, detecting tax evasion. Career Growth: Superintendent-Assistant Commissioner-Deputy Commissioner-Commissioner. Profile: Prevention of smuggling. File work in headquarters and assessment of customs duty, search, seizure, detention and arrest in field assignments. Career Growth: Enforcement Officer-Assistant Director-Deputy Director-Director. Profile: Updating case files, collecting information from different departments, maintaining records, monitoring vigilance activities of other central government organizations. Career Growth: Sectional officer-Undersecretary-Deputy Secretary-Director. Profile: Compiling reports, maintaining files, tracking cases and other paperwork. Career Growth: Section Officer-Deputy Director-Joint Director-Director-Principal Director. Profile: Research-oriented work as an investigative officer for the Intelligence Bureau. Career Growth: Sectional officer-Undersecretary-Deputy Secretary. Profile: Preparing notes and reports. Career Growth: Section Officer-Under Secretary-Deputy Secretary-Director. Profile: Work with the state police. Career Growth: Inspector-Deputy Superintendent-Superintendent-Senior Superintendent. Profile: Work in government departments such as Election Commission, Personnel & Training, and Parliamentary Affairs. Career Growth: Section Officer-Under Secretary-Deputy Secretary. Profile: Carrying out audits for the state governments. Career Growth: Divisional Account Officer II-Divisional Account Officer I-Sr. Divisional Account Officer. Profile: Carrying out checks on opium poppy cultivation, monitoring smuggling of banned drugs. Career Growth: Superintendent of Narcotics-Assistant Narcotics Commissioner-Deputy Narcotics Commissioner-Narcotics Commissioner. Profile: Working in different government departments. Career Growth: Varies from department to department. Profile: Carry out investigations into terrorism and other national security-related issues. Profile: Collecting and processing data to help the implementation of government schemes. Career Growth: Senior Statistical Officer-Assistant Director-Deputy Director-Joint Director. Profile: Promote post office activities and business. Career Growth: Assistant Superintendent of Post-Postal Superintendent-Senior Superintendent of Post (GP: 5400)-Senior Superintendent of Post (GP:6600). Profile: Preventing narcotic drugs from entering the state. Career Growth: Inspector-Superintendent of Narcotics-Assistant Narcotics Commissioner-Deputy Narcotics Commissioner-Narcotics Commissioner. Profile: Generate audit expense reports of the state department, accounts of defence forces and general accounts of the country. Career Growth: Senior Auditor-Assistant Audit Officer. Profile: Assessing, modifying and verifying tax data of a business or individual as well as goods and services. Profile: Clearing bills, office expense and salary allowances. Career Growth: Senior Accountant-Assistant Accounts Officer-Principal Accounts Officer-Senior Accounts Officer. Profile: Maintain files and corresponds for the concerned department. Profile: Drafting, compiling reports and conducting the census. Career Growth: Limited scope of promotion. Depending on vacancies, one can reach the post of director. Profile: Handling accounts, loans, funds and pensions. Profile: Handling office work delegated by superiors. 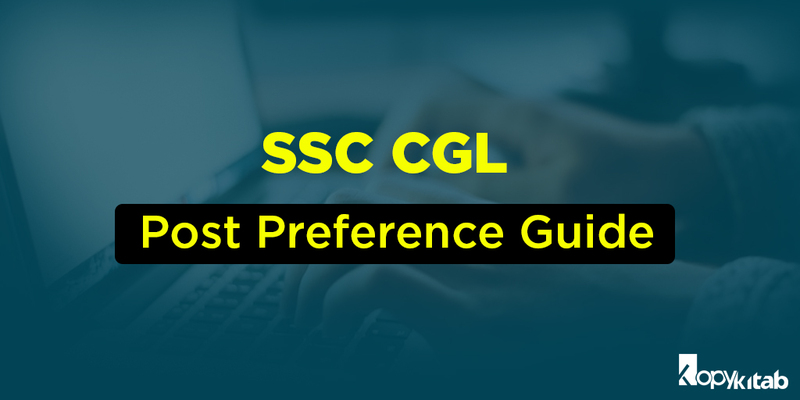 With these details, you make an informed decision about your SSC CGL post preference. All that’s left to do is study hard to land the post and department of your choice.